An infostripe is a customizable profile page for the information you want to share, uniquely formatted for any device. 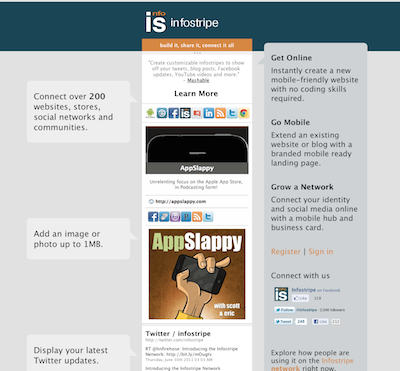 An infostripe is an easy way to establish a new web presence. And it’s an integrated mobile site for your existing brand. And it’s a hub connecting and organizing your online identity. And it’s a notebook, event planner, invitation and more.